Canned mandarin oranges are the preserved fruit of tangerine trees. 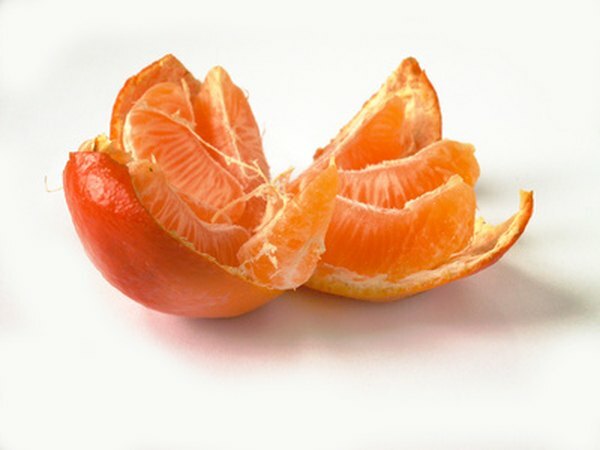 The fruits are smaller than regular oranges with a rind and section membranes that peel easily to reveal tangy, sweet and succulent orange sections. These are then canned for sale and storage. A single serving of canned mandarin oranges provides significant amounts of vitamins, especially vitamins A and C, and minerals including zinc and copper. A one-cup serving of canned mandarin oranges weighs 189 grams. According to the USDA Nutrient Database, 18 grams of this serving is carbohydrates with 16 grams of that amount coming from sugars. This serving also contains just 1 gram of protein and little appreciable fat. Water and other nutrients make up the remainder. The USDA Nutrient Database indicates that a single cup of canned mandarin oranges delivers a total of 72 calories. Carbohydrates deliver the most at 66.4 calories per serving. Protein makes up around 4.8 calories and fat 0.6 calories. A single serving of canned mandarin orange has around 4 percent of the total daily caloric intake for the average person. Canned mandarin oranges contain significant amounts of some vitamins. They are especially high in vitamins A, with 2480 IU or almost 90 percent the recommended daily amount, and vitamin C, with 64.1 mg or about 75 percent of what is needed per day in a one-cup serving. The same serving size also contains 0.2 milligrams of thiamine at 18 percent. Lower quantities of other vitamins in canned mandarin oranges include vitamin E, riboflavin, niacin, vitamin B6 and folate. A one-cup serving of canned mandarin oranges also has small amounts of some dietary minerals. These include 1 milligram of zinc and 100 micrograms of copper, both at 11 percent the recommended daily amount, and 257 milligrams of potassium and 21 milligrams of magnesium, both at 5 percent of the daily requirement for the average adult. Trace quantities of calcium, iron, phosphorus and selenium are also found in canned mandarin oranges. A single, one-cup serving of canned mandarin oranges has 2.3 grams of dietary fiber and contains no cholesterol. A significant amount of the food value in canned mandarin oranges comes from sugar.